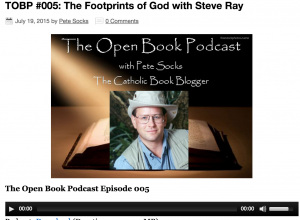 Recently I had a delight time with Pete Socks of the Catholic Book Blogger. We discussed the making our our latest Footprints of God DVD entitled Abraham: Father of Faith and Works. You can visit his site and listen to the interview here or by clicking on the image to the right. You can get your name in the Giveaway to win a copy of the DVD by clicking here.